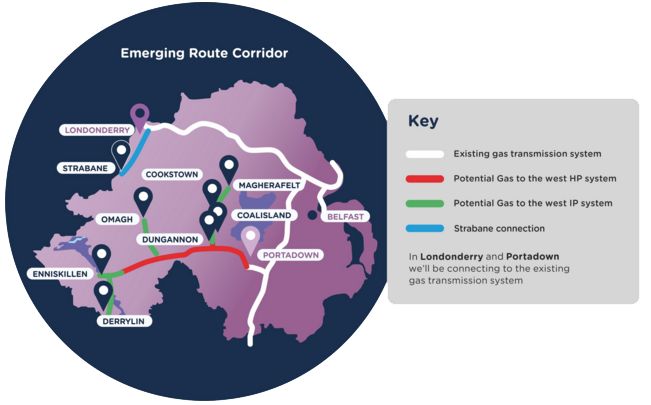 With full planning permission having been secured in mid 2017, the main works contractor for Gas to the West (Murphy GMC and Roadbridge) has been appointed and the major construction phase of this £250 million infrastructure project got underway in October 2017 in counties Tyrone, Derry and Fermanagh. Murphy GMC and Roadbridge will be responsible for the specialist engineering and construction of 200km of gas pipelines in the Cookstown, Coalisland, Derrylin, Dungannon, Enniskillen, Magherafelt and Omagh areas. SGN Natural Gas is scheduled to deliver mains gas and meters to 40,000 customers over the next 40 years in eight main towns in the western area. The investment in Gas to the West will support around 200 jobs during the construction phase and the new gas infrastructure is expected to sustain a significant number of ongoing jobs for installation sub-contractors and other related functions. Please see www.GastotheWest.com for further information.